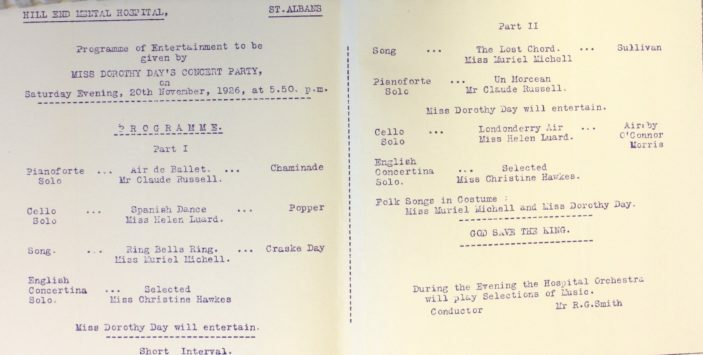 Miss Dorothy Day's Concert Party 1926 | Hill End, Entertainment | Out of Sight, Out of Mind? This is the programme for Saturday evening, 20th November 1926, and the entertainment was given by Dorothy Day. It is not known if ‘Miss Dorothy Day’ was a patient, member of staff or a member of the public. Other women also contributed to the entertainment on that particular evening. As usual at the end, ‘God Save The King’ would have been played, and the hospital’s orchestra would have performed a selection of music. This page was added on 18/06/2010.